I found these lovelies in my closet today! They were stashed in the backpack I took with me to Europe this summer! 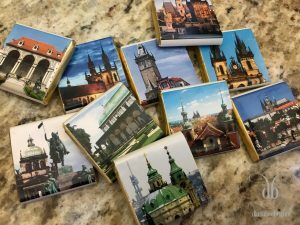 These pretty little squares are chocolates I bought in Prague, Czech Republic. Each one has a photo of a famous place there. Why they were still hidden away, I couldn’t tell ya! Prague was beautiful and full of people. We managed to see the Charles Bridge (did I mention all the people?) the first night. Then, it rained like crazy most of the next day, so we didn’t get to see most of the buildings and statues on those little chocolates. Instead, we went to a museum with three exhibits to escape the cold downpours: Salvador Dali, Andy Warhol, and Alfons Mucha. I was in my happy place surrounded by art and art history! We stumbled on some quirky places, too. The little James Bond cafe became a hideout for us when it stormed. One restaurant had an American Jazz theme with a Laurel and Hardy statue in it (why? ), but the food was delicious. Have you visited Prague? What things have you found later after returning from a trip? I’d love to hear your travel stories.